Mike and I are so excited to welcome our first child in July! As you know our journey to get here was long and arduous. With strength and determination we have finally achieved our dream! And if you know me, you know that being a mother has been my dream since childhood. You may also know that I always seek the best deal in every purchase I make. I clip coupons and research the most cost effective purchases. That’s why I chose BabyList to register for our new bundle of joy. I have compiled a list of the items we will need for baby Clooney but you choose where you want to purchase them! Just don’t forget to mark your purchases on the registry as to not duplicate! I have listed the best prices I could find for them and the location(s) to find them. I hope you have fun shopping like I do...and don’t forget to use your coupons/discounts. 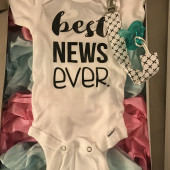 Buy Buy Baby accepts (unexpired) Bed, Bath & Beyond coupons, Kohl’s offers coupons and/or Kohl’s Cash, and Target Cartwheel has coupon offers...just to name a few! My heart is so filled with joy & love for this next chapter of our life and I couldn’t be happier to share this moment with you! Thank you for your support & love for baby Clooney!! !